Thursday morning the Chesapeake Bay Children and I stepped onto an Amtrak train in Richmond and by noon-ish were mesmerized by the hustle and bustle that is New York City. The trip came about when I asked my 17-year-old son (who has everything he needs/wants already) what he wanted for Christmas. Although I knew this little outing would not be inexpensive, I learned a long time ago never to put price tags on family adventures. So, with a little encouragement from Daughter and several talks with myself--one of which included the fact that Son graduates from high school next year and such opportunities for family adventures will be fleeting--I booked the trip. It helps that I have a wonderful blogger friend, Daryl, who lives in the city and is the best tour guide ever. We joined up with another wonderful blogger friend, Kate. The most rewarding part of blogging has been the friendships I've made that would otherwise have been impossible. We are all so different and yet have so much fun together. I feel very fortunate to have been connected to these talented, gifted, fantastic people. After settling in, we headed out for our first bit of culture shock outing, which was window shopping on Fifth Avenue. Every human being in the United States was on Fifth Avenue last Thursday. It's a fact. Admit it, you were there too, weren't you? I've never seen so many people before in my life. The windows on Fifth Avenue are an attraction unto themselves. The only window shopping I've ever done was back when Fosters department store was open in Mathews Court House. Let's just say that Fifth Avenue and Main Street Mathews are at the opposite ends of the Window Shopping Spectrum. The Fifth Avenue merchants go hog wild all out in their efforts to attract you. I was stampeded by the herd of humans running amok. plus the added bonus (?) of the image of me taking the picture. You haven't seen a window display until you've walked down Fifth Avenue. This diamondy looking lizard is draped around the front of a jewelry store. I cannot imagine how much this costs. spare change to purchase something like this. After oooing and aaaahing up and down Fifth Avenue along with the entire population of the United States, we made our way to Rockefeller Center, where we joined up with the rest of the population of the North America to admire the Christmas tree and do something really crazy unusual. Son, Daughter, and Daryl approaching the tree at Rockefeller Center. We paid money to be catapulted by some sort of Beam Me Up Scotty elevator to the top of Rockefeller Center, where I remembered that I no longer like heights and have a morbid fear that everyone in my party is just seconds away from being hurled over the edge of the very meager plexiglass protection. Way. Too. High. Up. The End. God in Heaven! These children are way too close to the edge! Get back! The wind is blowing a gale-- I think I just saw Toto fly by! It will lift you up and catapult you over the edge! Step back before it's too late! Daryl, taking a calm, cool, collected photo. FYI, she's way too close to the edge and nowhere near a wall to hold on to. holding on to the wall and breaking out into a sweat. We were almost higher than the sun. at the same level as clouds and the sun. Empire State Building, something is awry. After what felt like four thousand hours way too far away from terra firma, we finally made our way back down to Normal and took some time to admire the tree and the ice skating rink. Those are ice skaters down there where it's safe, on ground level. Not eye level with the clouds. Friday afternoon Son and Daughter wanted to do some shopping. I like to shop about as much as I like gallivanting in the clouds, but because this trip was about them and not me, I agreed to accompany them. Did you know that in some stores--which happened to be the only stores the Chesapeake Bay Children wanted to visit--you have to actually (not kidding) WAIT IN LINE to even enter? Yes, it's true. And once you're inside, it isn't like a ride at Busch Gardens where you get something in return for all that waiting. No, then you are forced inside to rub elbows with the entire population of North and Central America all fighting over the exact same merchandise we can find here in Newport News. Also, did you know that shopping in Abercrombie and Fitch in NYC with teenagers is exactly like being in a discotheque (without the benefit of a bar or alcohol or the stamina and nerve endings of your youth) that pumps in mens' cologne every five seconds and the music is so loud that you can feel the bass beating in your chest AND the flashing lights in what is otherwise darkness can cause you to feel like you're spinning even if you're huddled in a corner sucking your thumb sitting at the foot of a display because it's the only place to sit and you have no interest in wandering around? Aside from Abercrombie and Fitch and Hollister, we went to Uniqlo, which is the exact opposite in that it was so bright I almost had to put on sunglasses. Instead, I huddled in the corner sucking my thumb and watched the entire population of the northern hemisphere pass up and down the escalator. Do people actually dress like this? They do? The hats look like my great-grandfather's dipped in neon. OMG. The people. Were. Everywhere. OK, all kidding aside, I don't like shopping but I did love being on Fifth Avenue. I don't like heights but I did love being on top of Rockefeller Center. Daryl also took us through Central Park and into Times Square, which was amazing. She selected the most delightful places for us to eat including the incredible Robert at Columbus Circle, where Chesapeake Bay Son consumed smoked octopus as an appetizer. At our table overlooking the lights of Columbus Circle and Central Park, we were joined by Lauren and her daughter Emma. Kate's son Matt came along too. It was a perfect evening that ended with Kate and I and the kids escorting Lauren and Emma to Grand Central Station, where we had a final glass of wine and bid adieu. Pay no attention to the glare. I told Kate to aim right into the sun. CB Son, Daughter and I cannot thank Daryl enough for her hospitality. For her blog posts and pictures about this adventure, click here and here and here. Kate's blog post is here. Kate and Lauren, it was so good to spend time with you. Daryl, thank you so much for everything. You gave my family memories that will last a lifetime. hosted by our almost-next-door-neighbors, shown above. For whatever reason, even though we live close to one another, the neighbors rarely get together except for this one time of year--and have been doing so for for the past ten or so years. We always say, "We should do this more often, " or "It's been so long since we've seen you," but our busy lives always seem to get in the way of getting together. Each year it's held at a different neighbor's house. Speaking of houses, there are three vacant houses on our lane, one of which is for sale if anyone's interested. Middle Sister, who lives in Georgia, drove up with her husband just in time for the festivities. Middle Sis, Husband, CB Father and Hostess M.
The house was beautifully decorated. Speaking of good times, Son, Daughter, and I are headed out for a little adventure for the next several days. This blog will be on vacation until Monday, when I hope to report back all the fun we've had. It's been a busy several days here on Waverly Lane. Saturday night was the annual neighborhood Christmas party. Sunday night we had a family dinner that included Middle Sister and her husband. Middle Sis will be here for the week. Baby Sis will be coming home today. we will try to get together tonight to celebrate. Merry Christmas Eve and Happy Birthday to CB Mother! This nautical Santa Claus is on the right side of the road just before Cobbs Creek Market (now Stanstrings) if you're coming from the Blakes area. blue lights on the ground depict the water. It's really something to behold. I have to give this homeowner an A+ for creativity. May your weekend be full of fun and whimsy. p.s. Click here to read about my parents' latest Christmas antics. Here are a few more shots taken while I was wandering around the graveyard at Trinity Episcopal Church. As usual, I must digress for a minute and confess that when I typed the word "graveyard," I had to ask myself (a) where I pulled that word from because I hardly hear it any more and (b) what the difference is, if any, between the words graveyard and cemetery. "A graveyard from Old English graf "pit"; yairden "garden, open place") is any place set aside for long-term burial of the dead, with or without monuments such as headstones. In countries with a Christian tradition it is usually located near and administered by a church. From the early 19th century, new burying grounds were frequently founded as cemeteries, which are burying grounds that are separate from a church or parish.". I think it is safe to say that nowadays the words are interchangeable, but I am glad to know my use of an antiquated word is OK since we are talking about tombstones near the church. Let's return now to Trinity, shall we? Although it isn't an overwhelmingly large lot, there are lots of graves here. And even though most of the graves are decades (and some well over a century) old, the ground was soft, like a cushion, and gave way in many places. Almost as if the graves were recently dug. Also, it was frigid the day I was here, so if anything the ground should have been solid. Some of the tombstones are so old the names are difficult to decipher. As I meandered about, I stopped to notice the windows. These were particularly interesting. Returning to the windows, this one looked familiar. Click here for a post about Grace Providence Church down Mobjack that contains a photo of another window featuring an anchor very similar to this one. Although I remember the pictures from that particular post, I did not remember most of what I wrote. And I have to say that silly post made me laugh reading it two years later--the Walmart part in particular. Isn't it wonderful when you can entertain yourself and make yourself laugh? This sort of talent comes in very handy when you live in an isolated place like Mathews, which has limited options for entertainment. Even if you aren't considered entertaining by others, at least you can entertain yourself. Also, do you see how I reference a blog post about Grace Providence Church and then go on to say that the part that made me laugh had to do with Walmart? Do you know how far apart the topic of Walmart is from a church? Have we even talked about Trinity in this post? Notice the orb in the upper left corner. A ghost perhaps? If I were retired and/or independently wealthy and/or able to sustain myself and family without having to work, I would spend a great deal of my time wandering around places like this and writing silly blog posts and nosing around in the library and the public records trying to piece together a story for each place. As it stands, however, I must keep my day job. So I don't have a lot of time to wander, explore, and play do research. But I can still write silly blog posts. A while back I began some informal research on my family's property, which led me to spend an entire afternoon nosing around the county clerk's office. I was definitely probably supposed to be cleaning the house or doing laundry, but I felt certain my time would be better spent researching deeds and wills. The long story short is I learned, not surprisingly to me, that our property once belonged to the estate known as Clifton, which is right across the cove from us by water and right around the corner by road, within reasonable walking distance of where we live. While poring through all the records, I swear I saw where someone in the line of people I was researching was buried at Trinity Episcopal Church, shown here. I wrote down about ten pages of notes in a binder, and when I got home tossed the binder in the corner never to pick it up again until last night. I am highly proficient at starting a project but rarely able to finish one. I'm also exceptionally gifted at coming up with ideas for projects. Implementation, however, presents quite the problem. As a result my life is one great big To Do list that is never completed. The primary name associated with Clifton is Hudgins, which not coincidentally is also the name of the area in which we live. This group at Clifton is responsible for every single last a long line of Hudginses all around Mathews. The other name that stood out was someone by the name of Christian, who married one of the Hudgins girls and subsequently inherited a piece of the Clifton family estate--i.e. the property on which we now live. All this is a very exhausting long way of saying this: The other day I stopped at Trinity because I was dillydallying happened to remember I wanted to look at the graves. Since it had been so long since I'd done the research, I figured I'd just look for anyone by the name of Hudgins or Christian (the only two names I remember) on the tombstones. I didn't see a single Hudgins and not one Christian. Last night, knowing I was going to put up these pictures, I decided to pull out my binder of notes. As it turns out, most of the people I am looking for are buried either on the Clifton property or in the Haynes cemetery, which is across from Mathews Chapel down near Hesse plantation. I couldn't find a reference to Trinity. I swear I remember reading that someone connected with that Clifton family was buried here though. A church on this same site is referenced in very early vestry books of Kingston Parish. 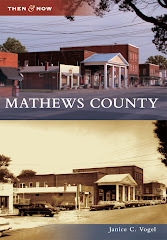 According to History and Progress, Mathews County, Virginia, the books contain "records of fourteen meetings, dating from ...1679 to 1725...When these records began, there were already two church buildings in the parish, referred to as the upper and the lower churches, or sometimes as the new and the old churches...the book reports only the meetings of the upper, or new, church, which stood on the site of the present Trinity." So, this property has been affiliated with a church from the very beginning of the history of Mathews. In conclusion, Trinity has deep roots in this county, and Chesapeake Bay Woman needs to remember to reference her notes prior to coming up with excuses to wander around graveyards and avoid work striking out in search of the graves of people once affiliated with her property. She also needs to write more legibly, because most of those 10 pages of notes are chicken scratch difficult to decipher. Tomorrow I'll post a few more pictures of this quaint church. Sorry for all the side trips, but straying off course seems to be another forte. Thanks for coming along on this longer-than-really-necessary excursion today. My weekend was spent doing a whole lot of nothing other than watching CNN's coverage of the unspeakable tragedy in Connecticut. Which meant I spent most of the weekend trying to imagine and take on on the pain and suffering of all those parents and grandparents and sisters and brothers and others who are impacted by such a devastating event. Which seems to have thrown me into a bad case of the Winter Blahs as I write this Sunday evening. Because of all this, I don't have a lot to say today other than I am so grateful to have my two happy, healthy children safe and under my roof.